A fantastic competition was held today between 25 pupils from yrs.4,5&6 competing for the Urdd's cooking award : Cogurdd. This is the first year the school has competed with the children having fun whilst cooking a 'Sunset Pasta Salad' in order to choose a winner to go on to the next round to compete aginst the best in the county. Many thanks to Dilys from the restaurant 'Gannets' for adjudicating, and for deciding on a very worthy winner - Rhys from year 6. Best of luck in the next round, Rhys! This week three of the school staff are visiting schools in Finland as part of the Comenius Project. 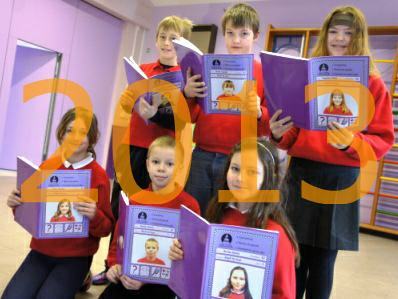 The picture shows pupils from Year 3 holding 'Happy New Year' cards made especially for pupils in Martinniemen Koulu school. During the past few months, pupils have had the opportunity to communicate with other schools in the project via Video Conferencing and correspondence. I'm sure the pupils in Finlad will be delighted to receive the cards! Well done everyone who ventured all the way down to Cardiff for the Urdd National Swimming Finals on Saturday. On Thursday morning, Year 6 visited Aberystwyth University to attend the Annual Chemistry lecture. The theme of the lecture was energy, and how it is possible to convert energy from one state to another. We learnt also that you cannot create or destroy energy. Many exciting experiements took place with children from every school present helping with various tasks. Here are some pupils assisting with an experiment, where they mix chemicals in order to see chemical energy changing to light energy. Everyone enjoyed a very interesting morning in the company of experienced scientists. Congratulations to the school's Netball Team on winning the Aberystwyth Area Netball Competition organised by the Urdd. They will now go on to play in the Ceredigion County competition. Best of luck to the team in the next round. This term's theme for the Reception Classes is 'People at work' and so this morning the Fire Brigade came to the school to show the children what Firemen do at work every day. The Fireman showed the various equipment the lorry carries and what they are used for. He also showed the enormous water hose they use to extinguish fire! It was brilliant! Many thanks to all the firemen who came to visit us this morning. During the past few weeks students from the Drama department at Aberystwyth University have been visiting the school in order to lead drama workshops with Year 4 pupils. "During today's workshop we were all busy working in our groups to build various shapes with different large cardboard boxes. It was a lot o fun." Thank you to members of year 6 for sharing their new year's resolutions with us in our first whole school assembly of the year. Some of the resolutions shared were to keep the beddroom tidy, play less on the computer, go to bed early and get up earlier in the mornings; eat less chocolate and more fruit; play outside in the fresh air rather than sit in front of the television; help parents more around the house. We hope they'll manage to keep to their resolutions throughout the year!